It all seems simple in hindsight. If there are other organizations without borders, why not have one for welding? Colton received national recognition for service in education in Peru from CEO Jorge Merzthal of the Soldexa Corporation. That was the idea that spurred Samuel Colton, Sr. into creating Welders Without Borders, also known as Soldadores Sin Fronteras. 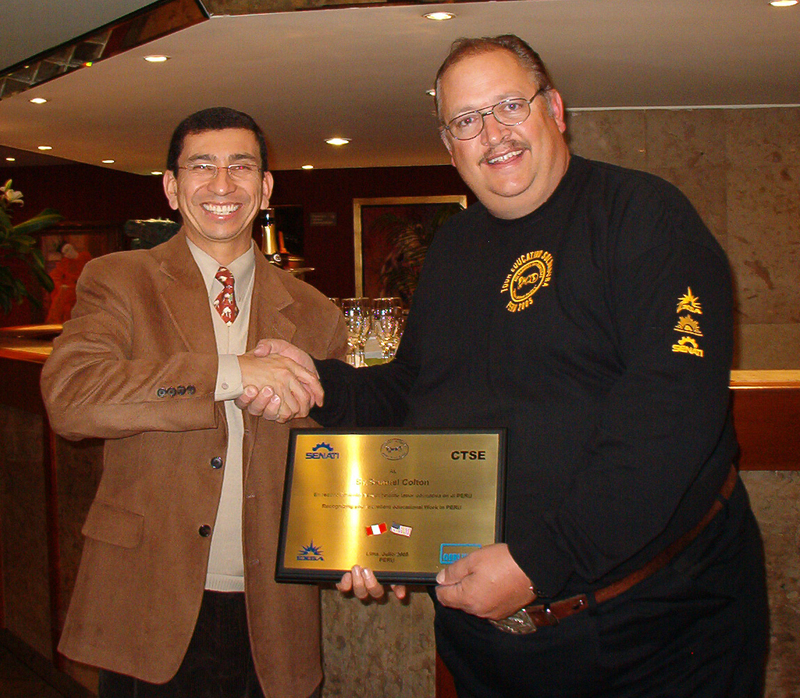 Colton, a welding educator and the organization’s founder, recognized that there was a global need for skilled welders. Virtually every country that was setting out on some civilized endeavor needed someone to literally help build that endeavor. Colton started thinking about how he could demonstrate the portability of welding skills to his students. Before long he was formulating ways to work and serve in other regions and countries to demonstrate the universal need for welding in a real and personal way. “I had a number of students who were studying welding at the Arizona Western College Institute of Welding in Yuma who were from Mexico. Together we organized a special pipe welding event at our college with a team of highly skilled Mexican pipe welders,” Colton said. The welders had an audience of about 80 people and they performed a live welding demonstration. These demonstrations were valuable educational tools for his students. Colton knew it was important for students to understand the way that welding could affect lives, and the relevance of welding around the world. It was a way of getting students to think about the industry outside of their backyards. It was also an opportunity for Colton to broaden his student’s horizons about other cultures and nationalities. “I wanted a cultural component,” he said, “so we partnered with a local Mexican folkloric dance group and our own AWC Jazz Band.” Once the excitement of the welding demonstration wound down, everyone settled in for “an evening of full on cultural exchange.” The evening eventually came to a close with a recognition ceremony to thank the Mexican welders and their Mexicali Mexico-based company, EMSA S.A, for supporting the event. After, Colton ended up accepting an invitation from EMSA S.A. to work as a six-week volunteer alongside pipe welders in Mexico with the hope of better understanding the unique challenges and benefits of working as a Mexican welder. 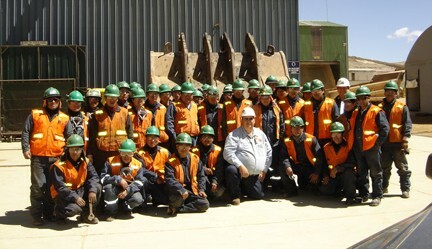 Colton with a group of welders in Peru at the Yanacocha Gold mine during a Welders Without Borders education tour in 2005. The demonstration, the cultural celebration, and the volunteer work abroad formed the heart of the organization that Welders Without Borders has become. Since this event, Welders Without Borders has hosted numerous special, and always fun, welding events during the school year at Arizona Western College and in places like Bolivia, Peru and Spain when school is out. “These events are supported by welding industry leaders who believe, as I do, in the power of youth to help build a strong future,” said Colton. Join us next week when we spotlight one of Welder’s Without Borders most exciting events: “Welding Thunder” an intense and fun competition where welding students and teachers can showcase their skills. We’ll also be telling you when, where and how you can catch this year’s competition. Until then, we invite you to visit American Welding Online where you can learn more about other exciting welding events, including the upcoming Manufacturing Day 2014. You’ll also find online courses, virtual conferences, and other digital tools to help you advance your welding career. Can’t wait until next week? Visit the Welders Without Borders website to learn more. Congratulations, Colton. This is a brave step needed for a great endeavor. I’ve had a similar idea, but never found a way to initiate it. I’m interested in contributing time and efforts to this. As I believe that so many regions need better opportunities, better choices for their young people. A program like Welders Without Borders gives that choice while allowing them to provide rewarding contributions to their own neighborhoods. Whether it’s fabricating a way to move a resource through the region, or providing manufacturing for the local economy, these are good choices. These things can help bring so much to areas that have very little. Mr Colton, congratulations for reaching across international boundaries to support the growing demand for welding professionals and the welding society. Students and professionals on both sides of any border can learn and work together and thanks to you this is now possible. Thank you for your dedicated service to students and professionals. Again, congratulations for putting this group of technical experts together and I wish you the best in the group’s future.